This aquarium would make an ideal last-minute Christmas gift, says Nathan Hill - and he's not giving his up without a fight! Do I sense a wave of these new, longer-shaped tanks hitting the market? I hope so because I love them. This tank has just become my latest project, but what I'm doing with it is top secret — for now. Inside the packaging I was met with a well-constructed glass box with smart aluminium edges. At the business end, where the pump and media are incorporated, the glass is frosted and credit to Fluval for finding a way to make a filter look smart! The filter itself is huge for the size of tank and wins lots of brownie points for being in the form of an open chamber. I cannot wait to play with and tweak mine, trying out different resins and media, although if I'm honest there's nothing wrong with what's supplied. You get a huge block of foam, with chambers cut into it, housing carbon and biological media. Be sure to open the filter up and unbag it all before you fill it with water. The space dedicated to filtration goes way beyond what is needed for a tank this size, so although you still don't want to overstock it you do have some peace of mind. The pump sits next to the filter in an empty chamber and I have to confess I'm twitchy about it. I've had bad experiences with pumps of this nature, so the proof will be in the long-term pudding. Lighting is from 37 LEDs in a very plush unit that clamps on just behind the filter. Sucking up 2.4 watts of energy, it's not going to bankrupt anyone in the foreseeable future. You have the option of plain white, which is nice, or a two LED blue night time effect, which is futile if I'm honest. It's the only letdown of the whole kit, so I don't use it. Oh, you'll also need to scout about before you find the light switch. On the side of the LED strip is not the most obvious position. For me, the attraction is that length. For ages I've seen people sticking livestock into nano set-ups without sufficient space for fish to stretch their fins. With this, those rasboras of yours or that Siamese fighter actually have somewhere further to roam. It also opens up a whole new dimension in small tank aquascaping and layout. 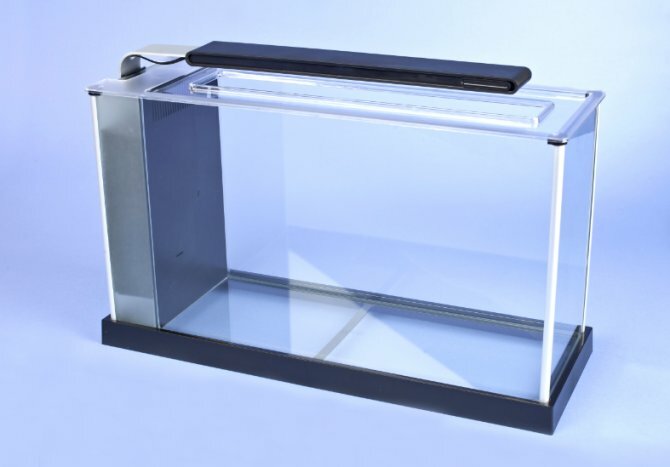 It's 43.5cm/17" long, by 27cm/6.7" high and 16cm/6.3" wide, with a volume of 19 l/4 gal, so hopefully it'll be taken a bit more seriously than other nano tanks which have had more than their fair share of detractors. I opened the box, had one look, and told the editor I was keeping it — and that he'd have to fight me if he wanted it back. Now I've got not just one, but two on the way. If after a last minute Christmas gift, or a first time tank with a little versatility, this is the one to ask Santa for.